You’ve checked in to your hotel room. Very stylish it is too – just like the website description. The staff are charming. And they’ve even got your name right on the in-room TV. So far, so good, but you’ve worked up quite a thirst on the journey. The mini-bar beckons. Wait, what’s this? A 200% mark up on a bottle of mineral water? At these prices, you’ll need something stronger. But one too many miniatures and you’ll max out your credit card. And don’t even start on the telephone charges. Making a call means agonising over international roaming charges or the equally exorbitant alternative – the hotel’s own call tariff. Just as it’s galling to book a flight at a reasonable price – only to find you’re subsequently charged extra for allocated seats and hold luggage, the uncomfortable feeling you’re being fleeced at every opportunity tends to take the shine off an otherwise enjoyable stay. It’s the same with WiFi – incredibly still attracting charges of up to £25 a day in some business hotels. And even when it’s “free”, we’re talking speeds that could give 56k dial up a run for its money. It doesn’t have to be this way. 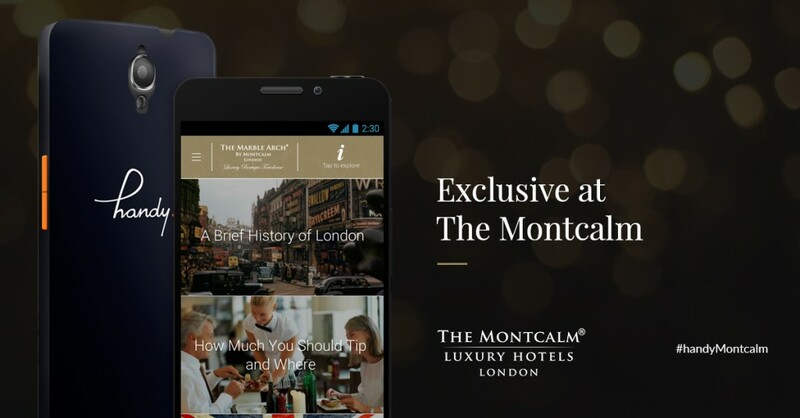 The Montcalm Luxury Hotels, one of London’s few independent upscale hotel groups, this month became the first in Europe to offer guests free local and international calls to selected countries with its complimentary handy smartphone service. handy is also pre-loaded with in-the-know restaurant and bar recommendations and places to visit in the vicinity, helping guests make the most of the city with ease – and without overspending. For international guests whose own service provider may well not operate overseas, nothing says ‘we’ve thought of everything’ like a replacement smartphone with credit. It also shows that putting the customer first by offering them the very best value during their stay, and running a cost-efficient operation, aren’t necessarily mutually exclusive. This is hospitality as it should be – treating a guest to the best of your neighbourhood at the best possible price, because you’ve been smart enough to negotiate the best possible deals with your suppliers. The handy collaboration is just one way that Luxury Hotels Group, partnering with The Montcalm Luxury Hotels on the project, is using digital innovation to enhance the guest experience – and the industry’s reputation. Long may it continue.